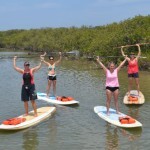 get up, stand up (paddle)! Our first foray into stand up paddling was a number of years ago. 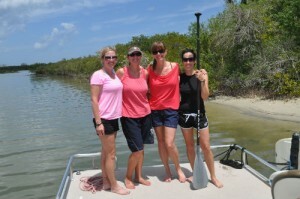 Dawn and Robin are my adventure girlfriends, and our friend Nikki came into town for her annual week at the beach. We thought stand up paddling could be an adventure, and so we gave it a shot. Our guide/instructor was patient and fun, and passed along her enthusiasm for the sport to us. Now, whenever the opportunity presents itself, the three of us are ready to jump on board and paddle our ways across the water. And if Nikki’s in town, she’s a good sport and joins the fun. When our friend Kim came into town not long ago, we wanted to introduce her to SUP, too. Kim grew up on a sailboat in Michigan and kayaks around the DC area, so we thought SUP would be right up her alley. 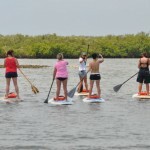 We made reservations with East Coast Paddle in New Smyrna Beach (on the east coast of Florida, just south of Daytona Beach) and anticipated our fun in the sun. When the time came to meet Tim and Cheryl from East Coast Paddle, the wind was gusting a decent amount and the Intercoastal waters were a bit choppy. 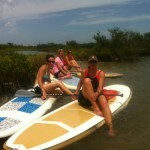 Tim navigated the boat to a cove where Cheryl could reintroduce Dawn, Robin and me to SUP, and teach Kim the basics. 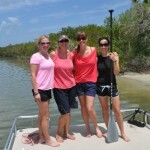 We all caught on quickly and were ready to paddle, with Cheryl leading the way. Or, we thought we were. The current was mighty strong, and we constantly had to paddle to the one side to keep our boards going in the right direction. It was not the relaxing day on the water we’d anticipated. After an hour or so of rough going, Cheryl corralled us to an atoll in the Intercoastal where we waited for Tim to pick us up. But she didn’t. As we hung out on our boards waiting for Tim, we were all smiles and laughs. Just like longtime girlfriends should be. Back onboard the boat, Tim and Cheryl toured us around the area, looking at the gorgeous homes and taking us to a spot popular with manatees. It turned out to be a great day after all, not in small part to how much fun Tim and Cheryl are. They really made the day. Will we go stand up paddling again? Absolutely – just not in strong winds! Photos courtesy of Cheryl and Tim @ East Coast Paddle – thanks for the amazing photos!